Get some relief from summer heat and workaday stress with charming nautical decorations that invite you to the river, lake or oceanside for a chance to cool off and relax. Water is a living medium, always full of surprises, no matter what sort of water it might be. Even stagnant water has its own sort of turgid life. Babbling brooks, rushing rivers, wide lakes and the vast ocean all call to us with a voice that is hard to ignore. So much of the life of our planet comes from them, small wonder that we humans like to decorate our homes with reminders of these cradles of life. Pick up almost any book about summer cottages or the seashore, and you will find the half rowboat featured in the craft section. By setting an old, flat bottom rowboat on its flat end, or by cutting off the ruined part of a leaky canoe, you can easily add shelving that can hold books or plants. Or you can add just one shelf, and have a shaded seat for looking out to sea. Miniature replicas are a great way to honor the big ships, even those that no longer regularly sail the seas. The ocean is, indeed, a vast place. To put together a miniature allows modern travelers to marvel at how frail these little barques of wood with a few squares of canvas once sailed to all parts of the world. Models can also enhance appreciation of more modern, ocean-going vessels. Add a little nautical flavor to your home with a wooden relief or a framed picture of boats. You could even pick up a print replica of a classic sailing ship painting, such as Fishing Boats at Arles. You can add wallpaper or a wallpaper frieze or rug that picks up the theme and keeps repeating it. Light up your night with boat-shaped lamps or with lampshades decorated with anchors, boats or other items that go with the waterways. Use a miniature rowboat or canoe to keep track of your keys and other small pocked stuff, or dress one up with a miniature scene to grace your table. Below are several ideas for wooden boat décor. 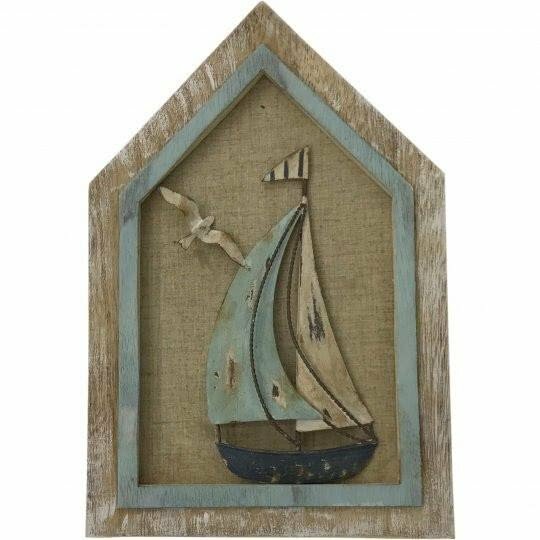 Give a room a nautical air with this house-shaped wooden relief of a sailboat and a seagull. The gull and sailboat are trimmed from flat wood stock, painted and distressed, then applied to a neutral beige background. The relief is framed first in distressed pale blue, then by rough barn wood. It’s an excellent selection for a seaside cottage. This set of two Birch Lane maritime wooden boats will make a conversation piece or a centerpiece for your next party. Lovingly handcrafted to resemble the rowboats that might be used to go from ship to shore, they can be filled with almost anything. Set one of them up with a cargo of coral for a nice decorating touch. Commemorate the ships of yesteryear with this three-masted square-rigger ship model. Neatly crafted and placed on a neutral, dark-colored stand, this little ship is ready to sail down your dining table as a centerpiece or to grace the mantel in your living room. It is brought to you from China by Cole and Grey. A gorgeous centerpiece, mantle decoration or topper for an occasional table, this model sailing ship will captivate all beholders. Offered by Cole & Grey, along with several other models, this charming ship will take you into uncharted waters of interior design as you mix and match with your other décor. The company has other assorted nautical choices that will go well with the model ship. The American Girls Handy Book, in Chapter VIII, gives directions for crafts for a seaside cottage, including how to make bookshelves using half of flat-bottomed row-boat. Here you have that same half of a rowboat in miniature, with one shelf and a lamp on top. A perfect reading lamp for setting the mood for Treasure Island, or even for reading about Jo and Beth, from Little Women, at the seashore. You can’t go far wrong with half a boat when decorating with a seashore cottage theme. In this case, the half boat houses a classic wine rack to keep your port or bottles of rum (yo-ho-ho) safe from being shaken about before their time. It holds twelve bottles, with the small top shelf reserved for serving glasses. Ornamental boat-shaped wooden bowl made of pressed fiberboard. Perfect for filling with white beach sand and adding miniatures to create a seaside panorama to place on an occasional table or to use as a centerpiece. It would also make a great landing space for keys, wallet and more. Meticulously structured to exactly mimic a triple cockpit powerboat, this Breakwater Bay scale model is sure to attract attention as a part of your model boat collection. Rare, high-quality wood is used in constructing this little beauty. Place it in your entryway, or use it as a centerpiece, because it surely deserves a place of honor. Sail away into the sea of dreams watched over by this cute Brundage wooden sailboat fourteen-inch table lamp. The base, shaped like a sailboat, is made of shaped wood, and the fabric shade shows a classic anchor decoration. It’s an excellent addition to any bedside table. As you look into your eyes, you see your face framed by a little blue & white boat bearing the legend, “Relax, you are on Lake Time.” Couldn’t we just wish! But perhaps this cheerful mirror will help get you through the week until you can really be on lake time, with your fishing line dangling in the water.